Trailer for 'Love Story' the romantic comedy from New Zealand director Florian Habicht’s about the construction of a fictional love story merges snippets of narrative with actual interviews with everyday New Yorkers to create an original film in which the boundaries of art and life overlap. Shot on the streets of New York, Love Story begins when Habicht finds a subject for his filmic experiment: the beautiful Masha Yakovenko, spotted at a subway station, carrying a slice of cake. Seeking advice from New Yorkers – strangers – on how to create his on-screen love story with Masha, he takes the notion of interactive storytelling to its logical end, crowdsourcing his plot on the streets. Romance blossoms artificially, and organically, between the director, actor, New York and New Yorkers. Be also sure to visit directornotes for their interview with Florian Habicht about making the film and a very interesting outtake. 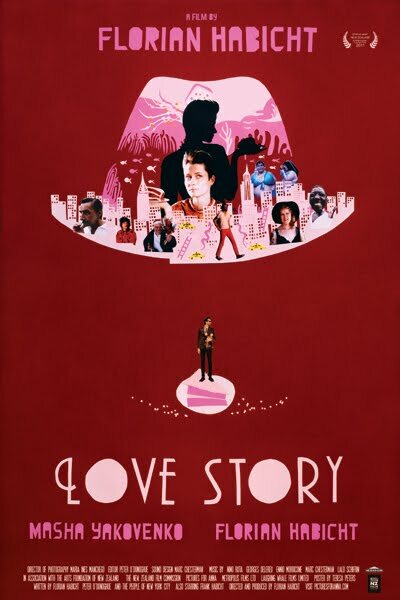 'Love Story' was featured as part of the BFI London Film Festival in October 2012 and is getting a Australian theatrical release in December, no news yet of a further release for Europe or America but be sure to check the films Facebook page for details.